Over the last year or so we have been in contact with a number of journalists from Ireland’s broadsheets, seeking their views on the media / property relationship. We asked why the issue has been ignored and suggested that the topic deserved open discussion – that perhaps it pointed towards a deeper issue of compromise between funding and journalism. Surprisingly, and without exception, journalists agreed that this was indeed an unhealthy relationship. Although we have agreed not to make these conversations public, we thought it was worth sharing some of these media insider thoughts with you. Though the authority is somewhat lost given the anonymous nature of these quotes, they are nonetheless valuable insights and admissions. These candid accounts are so rarely revealed in print. Few reading their daily paper will be exposed to admissions that newspapers are there to sell, primarily, and to inform, secondarily. There is also a worrying acknowledgement that journalists don’t even aspire to be the ‘Fourth Estate’, check and balance of power, that they often portray themselves as – “For the most part, we’re just the messenger.” A messenger for whom and for what? Those with the power to influence? Those with money, political clout and business connections? What is the media then, other than an extension of that power? Paul Gillespie, quoted above, answers these questions, explaining that political and business leaders “frame the terms on which the media report their activities.” The journalist’s hands are tied before they even put pen to paper. Despite this depressing conclusion, there are journalists with a willingness to discuss this issue, journalists who reject the pressure to act as “corporate stenographers.” Eamon Dunphy is one such journalist. Of course Dunphy could not know about Joe MacAnthony (interviewed by MediaBite in 2008) and hold the same regard for today’s Irish Independent, the two thoughts cannot exist together. Nevertheless, Dunphy has chosen to take on the most powerful lobby the media is forced to go up against, the media itself. Speaking on Newstalk’s ‘Lunchtime with Eamon Keane‘ with Irish Times Assistant Editor Fintan O’Toole in April this year, Dunphy reacted to the recent emergency budget and, to the shock of host, reflected on a decade of failure in Irish journalism. “EK: Eamon, what was your initial reaction to the budget? ED: …the biggest story in the budget is undoubtedly the National Asset Management Agency (NAMA). This idea of taking over bad debts and delivering responsibility to the taxpayer. We don’t yet know how this will work out, but it could potentially double the national debt, which is a problem for our children and our grandchildren. EK: How do you mean ‘in the media’? ED: The media were a huge part of this conspiracy to seduce, lure or terrify the Irish people into borrowing the amount they did. Principally for property, but not just for property. 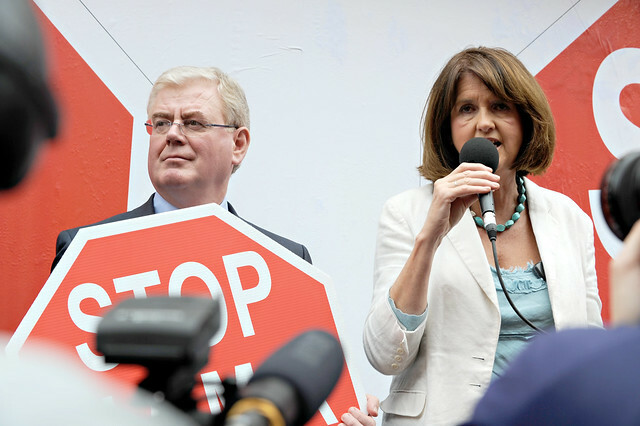 While the finger pointing has to begin with those who are most responsible – the government, Brian Cowen present Taoiseach and Minister for Finance for four years, where he threw petrol on this fire. If he didn’t know what David McWilliams, Richard Curran and an awful lot of other economists knew then he shouldn’t have had that job. The Department of Finance, the Central Bank, the Regulator – who failed to regulate the banks, they are principally responsible. But, there were others. The builders and the developers of course. And also the media, who are either cheerleaders for politicians or who are conspiring through property supplements and motoring sections, among other things, to conceal from people the reality – that you have to live prudently and that you have to have a certain modesty about your life. EK: Eamon, I’m glad to welcome Fintan O’Toole Assistant Editor at the Irish Times to join us. Fintan, would agree with Eamon’s assessment? FO’T: Broadly I would, yes. The key issue, when you get over the initial shock of budget, that you are faced with is that all of this pain and it is real pain for people is just in the margins, the big story is the bank bailout. The context you have to put it in is to say, look you are taking all this pain in order to limit the growth of the national debt and at the same time we’re doubling the national debt by taking all these bad debts completely into the public realm. The ordinary person in Ireland is effectively taking on the debts of Sean Dunne, Bernard MacNamara and all of the property developers and bankers who with absolute recklessness and greed lent these people money, including to buy properties which are not even in Ireland. A huge amount of this money borrowed was to buy property in the UK, half of London is owned by these people. Property in Bulgaria, in Hungary. People aren’t stupid, they realise we are in an absolutely appalling crisis and that have to take pain to get out of it, but we needed two things. One, we needed not to be told that [we need to reduce the national debt and] at the same time the national debt doesn’t matter because we can double it at the stroke of a pen. And two, we needed some articulation of how the country will look in three years time. If you go through this sequence of pain after pain, what kind of society might we get out of it? I was shocked that there wasn’t even a gesture, an attempt, to put some kind of context on these events. To say, the system that we have operated and driven into the ground is over, here’s what we are putting in its place. Nothing, not a single gesture to say we can have a decent sustainable society which provides some sort of basic security for the majority of the population. EK: Fintan, something Eamon said there struck me – maybe I’ve colluded? What he said in terms of the media, I’m interested to hear what you think about this. We had property features on radio programmes, we had newspapers doing property supplements and motoring supplements. There was a general collusion. So it is perhaps simplistic to just blame the government, the financial regulator and the central bank. We all colluded in this, including media organisations. FO’T: But even RTE can’t function without ads. So there is no part of the Irish media which is outside that circle. Everyone was in the business of advertising, and advertising is in the business of selling optimism and is in the business of selling debt – selling you things you can’t afford to buy. So Eamon is absolutely right in the sense that the entire media was part of that process. I think it fair to say however that part of this story is that a large number of people in the media have been saying for 8 or 9 years now, not just last year and the year before, really going back to the turn of the century, and not just as a matter of opinion, but saying in a very reasoned way – that looking at examples from around the world – this process is unsustainable, it is going to crash. ED: Fintan, where that warning should have been published should have been in the property supplement of the Irish Times. Journalism is really about serving the community and the reader. Where that particular, and I’m not blaming the Irish Times solely, the Irish Independent had a supplement and so did all the Sunday’s, but really if the Irish Times was cognisant of this fact and it had this contributor, Morgan Kelly, then he should have been published in the property supplement. This is where we all went wrong. Eamon Keane’s shock at the suggestion he might have “colluded” in inflating the property bubble is telling (it is worth listening to the exchange to hear just how surprised Keane is to hear Dunphy’s remarks). Only someone who has been living under a large rock for the last 10 years could reasonably deny Stewart Lee’s summation of media priorities: “Before all this happened all that was on television all day was programmes about how to buy a house, do up a house or sell a house for more than you payed for it, or do all three simultaneously.” Yet even an experienced journalist such as Keane, presenting the “freshest, wittiest and most challenging programming on the Irish airwaves,” is oblivious to the issue. Fintan O’Toole’s defense is as predictable as it is infuriating. He admits without reservation that “the entire media was part of that process – selling you things you can’t afford to buy” and yet cites Morgan Kelly’s warning in 2006 as evidence that the media supports a “plurality” of views, failing to mention that much of the negative response to Kelly’s piece came from the media itself. And despite Dunphy’s appeal, there is little evidence to suggest the media will ‘hold its hands up’, without that is, a concerted effort by readers to force them to. To read Part 1 of ‘Don’t shoot the messenger’ click here. The agency, established to “oversee the transfer of the dodgy loans held by the banks, loans amounting to €90 billion,” will take on billions of Euro in debt owed by developers, essentially making the public liable for the private sector’s ‘commercial risk’. A risk which has been realised in the ghost estates mercilessly documented by Eamonn Crudden in his short film ‘Wallets Full of Blood: Houses On The Moon‘. Properties sold as investment opportunities and, often secondarily, as ‘a place to call home’ will now not only become the crash landing of negative equity, but also the burden of additional tax. Taxes that will not be spent on public services, but set aside for the state financed bailout of a rich minority. By establishing NAMA, the government identified the primary cause of our economic difficulties. Not public sector inefficiencies; not uncompetitive wages; not excessive social welfare payments; not even reliance on low corporate tax rates. But reckless lending, by reckless financial institutions, to reckless developers, spurred on by a reckless government and all under the watch of a reckless establishment press. So how does this inconvenient fact fit into the recessionary narrative? Not very comfortably it would seem. As we discussed in ‘The Media and the Banking Bailout‘, the major problem facing the media is that it has been one of the leading proponents of the system which led us here. Newspapers disguised the true nature of the bubble economy, devoting ever more pages to property – the indestructible pillar of capitalism, now crumbling around us. A clear recognition of the media’s financial reliance on the property industry, yet it has not prompted a corresponding look at the potential journalistic compromises caused by this dependence. This reluctance to address a clear conflict of interest is at least partly due to the media’s resistance to certain types of criticism. Bloch’s criticism is certainly outwardly negative, but it also suggests some underlying broadly positive attributes. It suggests the media is uncovering and highlighting ‘bad news’ stories, such as banking irregularities, political mismangement and job losses, at the expense of ‘good news’ stories, such as feint signs that unemployment growth is slowing – the former reflecting negatively on business and politics, the later reflecting positively. This type of criticism therefore, reinforces the idea that the media acts as it claims – as a check and balance. This could then be dubbed ‘good’ criticism. Quite oppositely, when criticism appears to expose subservience to right wing establishment ideology journalists are far less willing to entertain it. For example, the Irish Times’ Sarah Carey was recently challenged by Michael Taft and Donagh Brennan of the Irish Left Review to substantiate her claim that the Irish welfare system offered “the most generous social welfare payments in the EU” (the inference being that welfare payments needed to be cut), a claim also made by a number of others. Carey was unable to establish a verifiable source for her “most generous” claim, simply deferring to information she had been passed by her ‘contact’ in the Department of Finance. The OECD data Taft and Brennan cited on the other hand contradicted Carey’s claim. In fact “a single person claiming social welfare in Ireland received payments that were 29 percent below the average of other EU-15 countries…Even poorer countries such as Portugal and Spain make higher payments.” Yet Carey refused to accept the error and more importantly failed to make a correction of equal prominence. This conservative meme also prompted an Irish Times poll with the none-to-subtle question “Do you think Ireland’s social welfare system is too generous?” and following a report by David Grubb of the OECD (Organisation for Economic Co-operation and Development), in which he laid out recommendations for an employment “activation programme” and suggested that the government should “tighten and modernise benefits administration,“ readers were treated to some sensationalist headlines. The sacred journalistic notion of ‘balance’ came in the form of a 200 odd word press release from Cori (Conference of Religious in Ireland) – “Generous Irish welfare a ‘myth'” – unfortunately resulting in yet another headline tying the word ‘generous’ to ‘welfare’. The issue of property is a thorn in the media’s side. A dirty secret omitted from debate. Stewart Lee, quoted above, is one of the few that have attempted to address the issue. But as a stand-up comedian, his analysis is unlikely to be subjected to further scrutiny in mainstream discourse. Satire is a forum for debate that the establishment is understandably unwilling to enter into. The failure to report accurately and investigate thoroughly during the bubble years raises very serious questions about the media’s ability to act as a ‘check and balance’. The continuing failure to acknowledge this issue undermines its authority to comment on the solution to the current crisis. Even on the rare occasions that commentators raise the subject, it is invariably met with a deafening silence. For instance, UCD’s Colm McCarthy broached the subject on RTE’s Prime Time late last year in interview with Donagh Diamond, acknowledging several times that the media were key stakeholders in the property bubble. Back in the studio however, Richard Curran, Shane Ross and Mark Little all suffered the exact same selective memory loss, unanimously failing to address this core part of Diamond’s investigation. More recently Prime Time dipped its toes into this relationship with a report by Derek Brawn, a former property insider, having worked as head of research for Savills (Hamilton Osborne King). Unfortunately, the report was introduced by Miriam O’Callaghan as follows: “Derek Brawn gives a very personal perspective on the boom, the bust and what it all means for you.” RTE clearly distancing itself from the “very personal perspective” at the outset. Brawn attempted to answer the question “Who really inflated the property bubble?” Citing some of the boom’s unreal price increases, he made clear how fraudulent the price explosion was. He reminded viewers of the €14m offer made on a Landsdowne Road house in 2005, for a house bought for €0.5m in 1994. A 35% increase in value each year. If that growth were to have continued, he explained, the house could have been worth €5.8bn in 2025. “Home values in Ireland have fallen by a fifth since the market peaked in 2007, but the estate agents and the newsprint media focus incessantly on aspirational or asking prices. Lately they have been guilty of exaggerating the price drops in order to fool the public that we are now close to the bottom. We don’t need an insider to spot this “black propaganda,” the evidence litters our newspapers. Yet Brawn is almost alone in commenting on it. Several weeks later, following a dearth of follow up commentary, Brawn was invited on to the Late Late Show to battle it out with property expert David Cantwell of Hooke and MacDonald. And again, despite appearing on the country’s most watched programme, he was almost universally ignored by his peers in the media (Kathleen Barrington did make passing reference in the Sunday Business Post). But this is not a view shared publicly by journalists. Brawn and Gillespie are most definitely exceptions to the rule. To read Part 2 of ‘Don’t Shoot the Messenger’ click here.